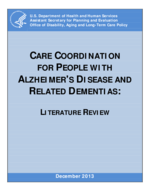 This review builds on previous examinations of the research literature on the effect of care coordination on people with Alzheimer's disease and their caregivers. Pimouguet et al. (2010) recently published a systematic review of eight randomized controlled trials (RCTs) of case management for people with dementia and their caregivers, concluding that the evidence is weak in terms of cost and resource usage. They suggest that future research should focus on which subgroups of patients are most likely to benefit from case management (such as those with multiple comorbidities, frailty, social isolation, or complexity). Koch et al. (2012) reviewed seven studies (observational and RCTs), with a slightly more optimistic conclusion. They cite two long-term studies that found that care management delayed admission to nursing homes. They urge that future research use a common definition for care coordination, look at people with Alzheimer's disease and caregiver quality of life, and follow participants for longer periods. They also advocate for a more inclusive approach to measuring cost-effectiveness, in which costs and benefits are evaluated from the societal perspective and take into account such outcomes as work and leisure time and caregiver health and well-being (Koch et al., 2012). Somme et al. (2012) conducted another recent review of six RCTs of case management programs for patients with Alzheimer's disease and other dementias. The authors analyzed the intensity of the intervention using Pacala's scale (1995), which rates the intensity of care management according to a number of criteria. Somme et al. (2012) concluded that there appeared to be a correlation between case management intensity and outcomes. The two programs that were determined to be intensive reported at least moderate clinical effects. In addition, one medium-intensity intervention reported a moderate effect on resource utilization, and the three low-intensity programs reported slight effects.